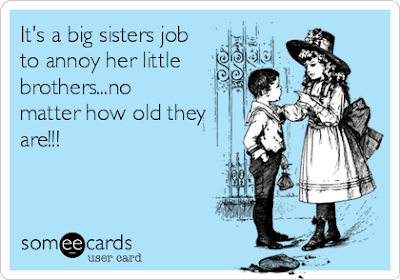 Today this post is for us big sisters, that have little brothers, whether they are just barely a year younger than us or more than five years younger than us, you already know by now as a big sister, your little brother was your first true love. In today's society that may sound a little off key, but for the big sisters reading this, your body instantly warmed, your eyes lit up or maybe even teared up and your heart began beating a little faster didn't it? Don't they say such reactions are associated with love? I myself have two younger half brothers, there is nothing half about them though, they put the shine in the sun for me everyday. My youngest little brother Riley is 13, about 7 years younger than me and my oldest little brother, Ethan is 14, about 6 years younger than me. I remember thinking how ridiculous and dysfunctional the little stinkers were. I began judging them right away, even as newborns, they had taken away my “only child” status and attention, not to mention I had to share everything with them so they wouldn't cry and I wouldn't be scolded for being selfish. Well let me tell you, I tend to be very selfish now for the simple fact that they almost always broke, scratched or cracked anything of mine they played with...People can ask to borrow a pen from me and I'll refuse...you big sisters know exactly what I'm talking about! Not to mention they were messy, had a weird baby smell to them and couldn't keep food in their mouths. Of course though past all of their irritating baby habits, I had fallen in love with both of them the moment I laid eyes on them. I was a typical little girl who enjoyed playing with her baby dolls. At five years old when my first baby brother arrived, you can bet your bottom I was excited to have a real live baby doll. I wanted to do everything! I wanted to feed bottles, I wanted to rock him to sleep, I wanted to bathe him, clothe him, change his diapers (I did very few poopers though) I wanted to love and care for them as my own and that's exactly what I did. My brothers and I were and will always be thick as thieves. Your little brothers are your first and biggest fans, even when you get older. They will support you in almost anything you do, more so than parents or grandparents. They will get into trouble with you, cry with you and laugh with you. They instantly become the best secret keepers on the planet. They also happen to be the best cure for tears. Who can resist a little pair of bright eyes wrapping their little arms around your waist saying,” Don't cry sissy, it will be alright,” when you've had your heart broken by some boy you thought was your first love. Little brothers always bring out the rough and tough in a girl. If you weren't before they arrived you are definitely a tomboy now. You can wrestle and fight like a man. You have no problem pinning boys to the ground in a mud puddle. Little brothers teach you how to build the best blanket forts, they look up to you so much that your biggest fear is failing in front of them- hence the empire state building of all forts. Little brothers are your protection against “bad boys.” When I reached the teenager age of mutual attraction, boys my age suddenly became interested in me. I didn't mind it but that was a big “NO WAY JOSE`” for them. I was in a mall once wearing a beanie crocheted to look like a raccoon, Riley and I were standing by a staircase waiting for our parents to emerge from a store. Suddenly a teenage boy around my age comes sliding down the stairs and says, “Hey girl, I like your beanie.” Of course noticing his beanie was an owl and taking a compliment like a school girl, I bubbled and giggled like an idiot. Riley however wasn't entertained, he kept giving the guy a dirty look, when the guy kept trying to make conversation eventually Riley had enough and said,” Man leave my sister and her hat alone.” The guy was seemingly caught off guard and walked away but kept making rounds all day, I assume he was hoping he would catch me without my little brother. Little brothers make awesome fill-in sisters. Even though they don't want to, they will let you paint their nails, do their makeup and hair and dress them up. They absolutely hate it, but they grin and bare it all for the sake of they know you would do the same for them. Unfortunately for them this usually inspires mom to get out the camera... I can't wait to show their wives one day! Little brothers are the adjoining peas in your pod. They can piss you off and make you laugh till you cry all in the same day. In this though, they show you how a man should really treat a woman. If he hurts you, he should say sorry, if you're going through a rough time, he should support you, if you're happy, then he should be happy. My little brothers were the first to bring me flowers, the first to buy me jewelry, the first besides my father to say “I Love You” and mean every ounce of that unconditionally. Little brothers are brutally honest. You can ask them if your hair, makeup or outfit looks good... And you have to be prepared for their answers. “That color looks awful on you, that lipstick makes your lips look funny, stop trying to dress like Miley Cyrus, you look like a clown.” It hurts but its real and they will never let you go out in public looking crazy because they know as women how self conscious we are. Little brothers are the only men that can get away with insulting you about everything and constantly picking at you. But the minute, they hear of some other man insulting you, whether its all in good playful nature, take a step back, good chances are, there is a swing headed that man's way. On numerous occasions Ethan has said, “Hey don't talk to her like that” earning him an outward eye roll from me but a little silent flutter of protection in my heart. Little brothers are your original best friend forever, no matter if you see them a little or a lot, you two can reunite after months of separation and instantly go back to the days when you hid under a blanket at night with a flashlight and ate marshmallows you snuck into the kitchen and stole after your parents went to bed. In fact you can always find a way to get into trouble even when you are older. I'd say mudding and coming back looking like a bunch of matted wookies is the easiest way... Mom still sprays us down with the water hose. Little brothers are the only men in your life you wont blow off to do something else. Little brothers are the original date keepers. When you tell them you are taking them out with you, they hold you to it, you're always glad too that you brought them along. I use to think they were always an annoyance but I realized I always had the best times with them by my side. Little brothers are the absolute reason for making your world spin. They are everything you aren't. When you need a leg up they're there, when you need a hand down, they're there. Most of all when you need love and a listening ear, they are there. Forever and always. All you big sisters out there, don't forget those little brothers of yours, they will always be there for you when no one else will.